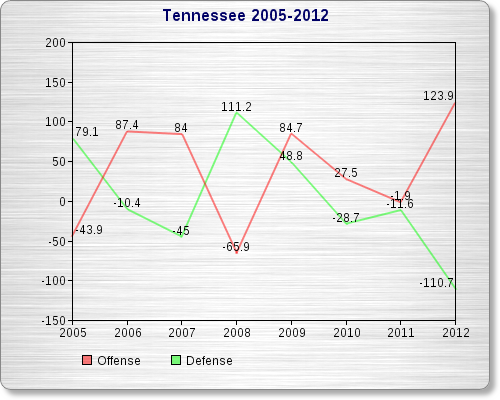 That chart shows a lot, and I mean a lot, of bad timing for Tennessee over the past 8 seasons. Seasons where they'd have a great offense to go with a bad defense. Seasons with a great defense hamstrung by a terrible offense. Only one year saw both sides of the ball better than average - Lane Kiffin's 2009 season. Bet you didn't expect that. I really railed on Dooley in my earlier article on his firing for the switch to the 3-4, and I'm gonna take a chance to do it again here. You can see that the defense had made some small strides in 2011, improving on 2010's season. And 2012's offense, as you can see, was pretty phenomenal. If the D just kept what it had, it still probably wouldn't have been very good, but it probably wouldn't have been this atrocious. It remains a baffling decision, and one that ultimately cost Dooley his job. 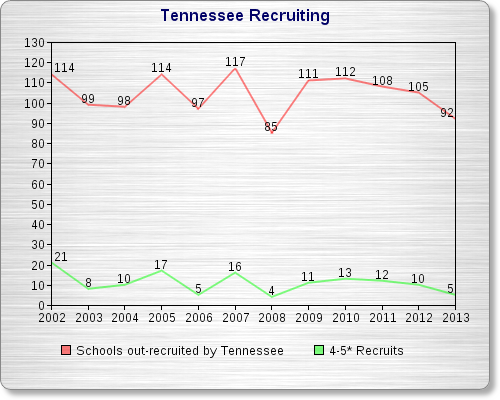 What does this recruiting chart tell us? Well, it tells us that Tennessee is unlikely to ever have serious problems recruiting talent. Even with Dooley sucking any and all excitement out of the program, they were still a top 20-30 school. That's clearly not up to par for Tennessee, and there was obvious decline. Dooley has managed to get a decent amount of star talents. However, it pales in comparison to Fulmer's halcyon days of the early 2000's. It's clear the Dooley staff was poor at recruiting. After all, some local high schools were basically ignored by the Dooley regime. These were even high schools that produce Division I talent, too. Most SEC coaching staffs don't even ignore the schools that don't produce top level talent. Dooley's ignored those that do. Enter Butch Jones from Cincinnati. The strangest thing for Butch Jones is that, for the first time, he won't have a hard act to follow. This is because, for the first time, he isn't taking over a program previously built with some degree of success by Brian Kelly. If you split the graph between 2009 and the second "Pre-BJ" column, you'll get a better visual of the effect Jones had at each place. When Jones became HC at Central Michigan in 2007, Kelly had built the program to generally successful levels. In 2006 (the "Pre-BJ" point at the Y Axis), Kelly guided the team to a 10 win season, the school's first since 1979. As you can see, he achieved that through very good offense and slightly bad defense. That's not a bad combination for a MAC team. In Jones' first year, the offense continued to drastically improve. Unfortunately, the defense struggled mightily. The team went 8-6, though they did win the MAC Championship. There was regression to the norm in 2008, but in relatively equal amounts: the offense lost 20 NEPA and the defense gained 30. The record saw only slight improvement to 8-5. In 2009, the defense made it into positive territory and the offense was better than ever, resulting in a second MAC title for Jones, and an impressive 12-2 record. This kind of improvement was exactly why Cincinnati hired him. When he arrived at Cincy, it had to be a sense of deja vu. Not only was he once again taking over for Brian Kelly, but once again Kelly left him with a team that was really good offensively and slightly bad defensively. Cincy was 12-1 in 2009 mostly thanks to that ridiculous offense with over 200 NEPA. Since then, Jones simply hasn't been able to match what Kelly did on offense. While Jones' offenses haven't been elite, they haven't been bad. They've all been quite stellar, as you can see. Interestingly, his defensive course at Cincy mirrored what happened at CMU. The first year took a step back defensively. With the dropoff on offense as well (resulting in a loss of over 160 NEPA from '09 to '10), Cincy fell to a 4-8 record, and many questioned Jones' job status. In year 2, the defense saw such a major improvement (+120) that the Bearcats returned to 10-win territory despite continued regression on offense. In 2012, the Bearcats are poised for another shot at 10 wins, having gone 9-3 thanks to continued success on defense and an improved offense. In any other year, this team would be 11-1 and in a BCS game, I think. However, 2012 saw marked improvement from Cincinnati's Big East brethren, and the 'Cats slipped to 3 losses. What does all this mean for Tennessee? Generally, I think it means things are going to get better. Despite the tendency for Butch's teams to take a step back defensively in year one, I'm not even sure that's possible in Knoxville right now. However, I wouldn't expect the defense to be good for at least a year or two. 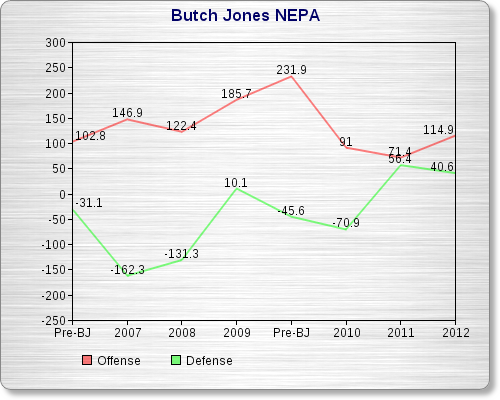 Still, if Jones' tenures at CMU and UC are to be believed, the defense should be fully functional by 2015. That is, they will if Jones was the direct reason for the other turnarounds. As for the offense, he should keep it somewhat productive. It's hard to know exactly what to expect from his offense, but he does have a pretty solid track record of point-scoring. Granted, this offense hasn't been built by Brian Kelly ahead of time, so it's no slam dunk. I'd expect some regression in 2013 offensively, but they should continue to be above-average. Of course, the big issue here is that Tennessee doesn't want things to simply "get better". They want to be Tennessee again. This is one of the ten winningest programs in college football history. They have more SEC titles than any school not called Alabama. That's the level Tennessee fans expect from their coaches. I can't think of a fanbase that has been let down over the last few years by their coaching staff more than this one, at least not in a purely football performance manner. I never thought I'd see the day where 8-4 might be looked at as successful, but that might be the case in 2013. It won't be the case for long, though, and Jones will be scrutinized heavily if Tennessee isn't challenging for the SEC East title by 2015. In fact, the rumblings will start if it doesn't happen in 2014. That comes with the territory, Butch. Ultimately, Jones strikes me as a real wild card as he enters the SEC. There's some track record to speak of, and it's generally positive. However, he's never really built a program from scratch. There's talent at UT, so this won't be completely from scratch, but every team he's taken over was a 10-game winner and conference champion the year before his arrival. He has surrounded himself with a coaching staff that at least knows the SEC and what it will take to recruit the South successfully. Unfortunately, two of these defensive coaches are best known around the SEC for their ability to prevent Matthew Stafford from ever winning the SEC title... And they weren't coaching against Georgia, either. He should have no problem recruiting for Tennessee (like I said above, the school's prestige recruits pretty well on its own), and Jones is a pretty proven success. Then again, the SEC is a fiercely different kind of conference than what most coaches are used to. My guess is that Jones improves Tennessee and makes them competitive again. I am skeptical that he will lead them to any SEC East titles, but the guy already has 4 outright or shared conference titles in his 6 year coaching career, so maybe he'll prove me wrong. Either way, an elite program just got a new coach. For now, Tennessee is somewhat relevant again, and for now, that feels like a win.